The ‘Splainer: Does Trump’s ‘Muslim ban’ flout the law? The ’Splainer (as in “You’ve got some ’splaining to do”) is an occasional feature in which the RNS staff gives you everything you need to know about current events to hold your own at the water cooler. (RNS) President Trump says his immigration order is not a ban on Muslims. But that didn’t stop several states, the American Civil Liberties Union, the Council on American-Islamic Relations and others from filing suits against Trump. How strong are these challenges to the controversial order Trump signed on Friday (Jan. 27)? And how do religious rights come into play? RNS talked to legal experts to better understand these cases as they make their way through the courts. 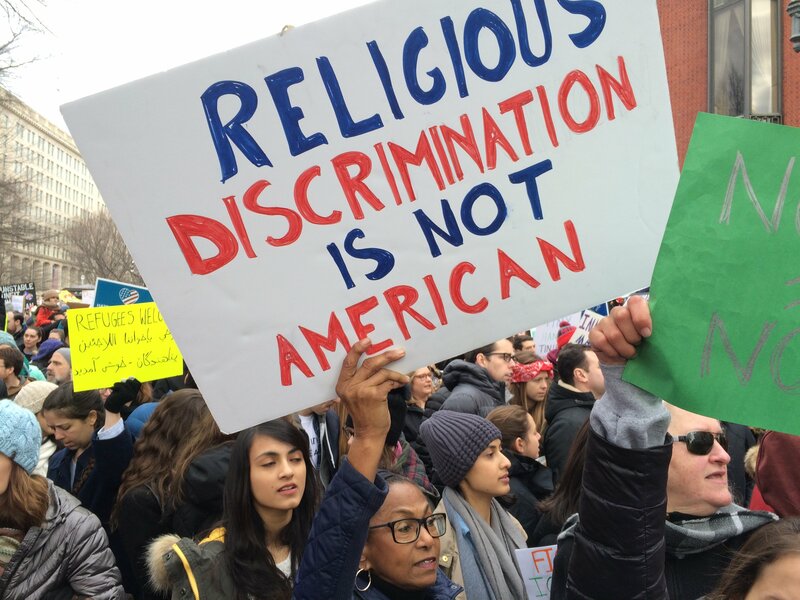 The order doesn’t restrict “Muslims,” so how could it be religious discrimination? “Is there anybody in the country who doesn’t think this is about Muslims?” asked Faiza Patel, an expert on national security law at New York University School of Law’s Brennan Center for Justice. True, the executive order, which includes a restriction on travel to the U.S. for nationals of seven Muslim-majority nations for 90 days, does not directly refer to followers of Islam. But that doesn’t mean it’s not aimed at them, critics say. During his campaign, Trump explicitly called for a “total and complete shutdown” of Muslims coming into the country. And even if courts opt to discount statements made on the campaign trail, plenty has been said around the rollout of the executive order that points to its discriminatory intent, Patel said. What are the constitutional objections to the order? Challengers say the order violates several parts of the Constitution, including the due process and equal protection clauses, and the First Amendment clauses that prohibit Congress from establishing a religion or preventing the free exercise of religion. The Christian preference “is the weakest spot” in the order, but “I’m still skeptical about whether you could make a successful establishment claim,” said George Washington University law professor Jonathan Turley, speaking on the PBS NewsHour on Tuesday (Jan. 31). But the ban applies to people who are not Americans — they don’t get constitutional protections, do they? The Constitution in some instances affords protections to non-Americans, legal experts say. But more important than the citizenship of challengers to Trump’s orders is their “standing,” said Rick Garnett, who teaches constitutional law at the University of Notre Dame’s law school. “Standing” is the ability to demonstrate a valid legal interest in challenging a law or rule. What do Trump’s lawyers have going for them when they defend the ban? Douglas Laycock of the University of Virginia School of Law, an expert on religious liberty issues and no fan of Trump’s immigration order, said that it may nevertheless pass constitutional muster. On what ground might the executive order be most vulnerable? “One section says ‘no discrimination’ and another section delegates enormous authority to the president, so the courts are going to have to reconcile those two provisions,” said Laycock. By going after green card holders we learned the Trump presidency has no clue what it is doing. At no point were the appropriate departments briefed as to how to interpret and enforce the executive order. So they were left scrambling figuring out what they could do or if it was even legal. The Pentagon was livid as the ban directly undermined their efforts and provided propaganda fodder for ISIS. We also learned that Bannon’s influence is a lot greater than expected. It was his idea to go after green card/visa holders because he really is just a racist SOB at heart. This executive order is completely arbitrary. The 7 countries picked aren’t noted for sponsorship for terrorism. But they are ones which lack full fledged diplomatic relations with the US (and are subject to US military actions). The Immigration and Naturalization Act already has a clause as you described. But evidently the laws aren’t good enough for people who wanted to enact pernicious religious tests. No doubt about it, both the original form of Trump’s executive order and its early implementation were Amateur Hour on display; there’s no excuse for it, they screwed up by the numbers. And you are also right, we can’t call all of Islam a sect that calls for the violent overthrow of the Constitution and its government. Instead, we’d need to look at the various schools of fiqh (four major Sunni schools and two or three major Shi’a, but those won’t be all of them) to see which of them include aggressive jihad, see which sects adhere to which schools, and rule accordingly. From my admittedly shallow understanding of the varieties of Islam most Sufi sects would be fine, most Sunni and Shi’a sects wouldn’t. And while Islam would obviously be the biggest concern, this wouldn’t apply to just Muslims — there’s a lot of Communists and Anarchists that it would cover as well. If Trump had bothered to run it by advisors who knew what they were doing and not sycophants, the order would not exist in the first place. ISIS is running wild with this one. Trump probably provided the biggest boost in their recruiting in years. Rather than play theological games with various sects and whatever one’s opinion of their beliefs, a sane form of vetting on this subject is always based on individuals. To see whether they belonged to individual congregations which preach violent radicalism, have personal or professional connections to those who do, or belong to organizations which support such goals. In other words, we vet people in the way we are always supposed to. The problem with categorical bans is that they are public, lazy and don’t improve security. Terrorists can easily look for ways to make end runs around the criteria employed. Much like they look to do with airport security. Like it or not, we are always working on their timetable. 9/11 was wildly successful because the planners knew the security loopholes and knew the playbook employed for terrorist takeovers of planes. By definition, any law that sets standards based on groups is “categorical” — such as, say, laws making it illegal for minors to consume alcohol, or vote. What’s wrong with actually looking at the content of groups’ teachings to determine whether we want their members to come to the US? That seems to me to be the opposite of lazy. “Lazy” would be simply banning all Muslims instead of making the decision sect-by-sect, then verifying the possible memberships of immigrants and refugees. Categorical actions make one predictable and easy to find end runs around. Frankly bigotry and expedience informs these categories far more than reasonable criteria. Because obviously it is wildly subjective. Especially given that people don’t generally view beliefs besides their own in a particularly favorable or reasonable light. It is too dependent on personal biases. Most of the evaluations people give here for beliefs other than their own are lazy and biased. I wouldn’t trust most people here to be able to such things in a reasonable fashion. For example, I have yet to see conservative Christians portray atheists in an honest light and we have at least two raving anti Semites trolling here regularly who will quote the Talmud to show Jews want to overthrow the nation. Also sectarian membership tends to be cultural, family based or even regional. Few really volunteer to join such things. so you are really going after people based on circumstances of their birth in the majority of cases. So it is not even close to a reasonable criteria in of itself. Vetting is done on an individual basis because it is sane to do so. We judge people by their actions. Otherwise you are not really vetting. You are just making wild and yes, lazy assumptions. This ban had no reasonable justification nor implementation. It was a president simply looking to see how far he could go. What he could get away with. A rather malicious way to exercise the limits of one’s power. Among people’s actions are what groups they choose to be associated with. If they want to come here, let them disassociate themselves from those hostile groups first. But since you have no problem with allowing into our country people associated with organizations, movements or sects that call for or teach the duty to support the violent overthrow of our Constitution and its government, I don’t see any point in continuing this. I do. Your definition of “hostile group” is overbroad, wildly subjective and unhelpful. The point is to vet for people who shouldn’t be in the country. Not people you just don’t want there. As for your last paragraph, your hissyfit is duly noted.